Come to Burke Landscape Supply for your lawnmower repair Delaware County! We service and repair most lawn equipment. We have two lawnmower repair and maintenance locations to serve all of Delaware County, Chester County, and parts of Montgomery County. Our location is just one factor to consider. Our professional and reliable services is untouchable in the area. 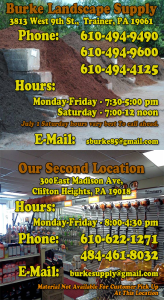 Look to Burke Landscape Supply for your service and repair. We offer reliable repair and service for most lawn equipment. In fact, our best maintenance and repair practices help to keep lawnmower repair costs down. We use manufacturer’s specifications for your service or repair. We also use OEM parts to ensure quality. Also, we recommend that you service your lawn equipment at least yearly. Call on Burke Landscape Supply to meet your STIHL, eXmark, ECHO, RedMax, and Ferris repair parts needs. You rely on your lawn tools. Then, you need to keep them serviced. We service and repair mowers, trimmers, leaf blowers and more. Our repair service is for most types of lawn equipment. Quality parts and tools are essential in the proper maintenance of your landscaping equipment. We carry mower parts including replacement blades, filters, pulleys, tires, and much more. Look to Burke Landscape Supply to find quality replacement and maintenance parts for the major manufacturers. We service and sell eXmark, Ferris, ECHO, RedMax and STIHL lawn tools. Choosing us gets you instant access to the best products from eXmark, Ferris, ECHO, RedMax and STIHL. Come to Burke Landscape Supply for your landscape replacement part needs. Not only do we have a full line of winter supplies and parts for your snow plows & salt spreaders, but we also have ice melt and salt.